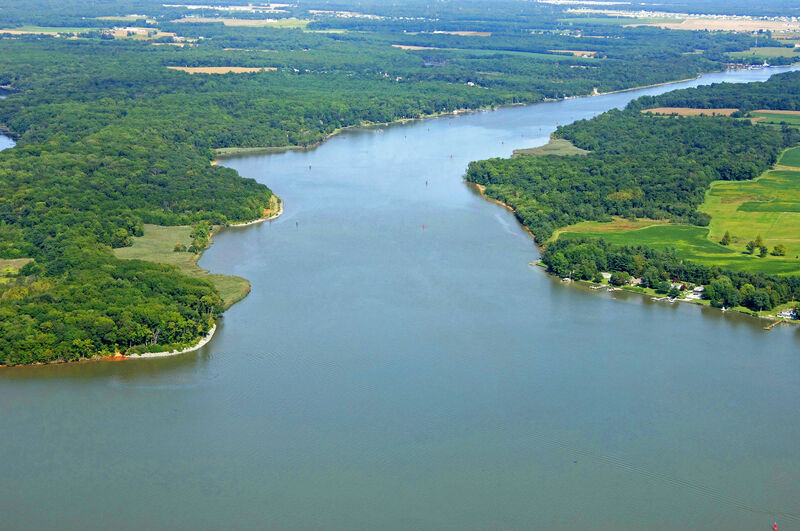 The Chesapeake and Delaware Canal (C&D Canal) is a 14-mile-long, 450-foot-wide and 35-foot-deep ship canal that cuts across the states of Maryland and Delaware, in the United States. 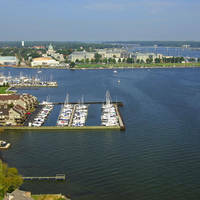 It connects the Delaware River with the Chesapeake Bay and the Port of Baltimore. The C&D Canal is owned and operated by the U.S. Army Corps of Engineers, Philadelphia District. The project office in historic Chesapeake City, Maryland, is also the site of the C&D Canal Museum and Bethel Bridge Lighthouse. The image above is a view from the southwest looking northeast over the western entrance to the C&D Canal. The long wooded piece of land to the left (north) shore of the inlet is Welch Point, with the upper portion of the Elk River visible farther off in the upper left corner of the image. 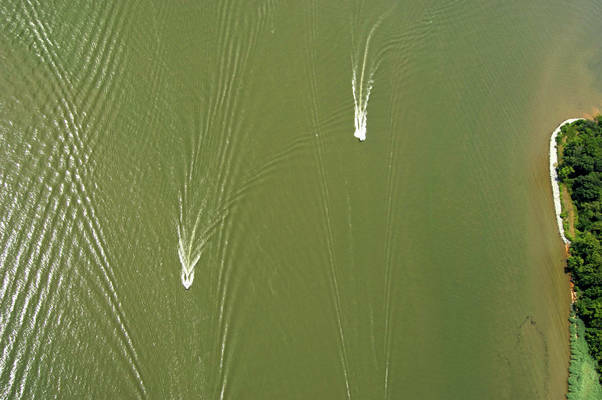 The approach channel is also clearly visible, with flashing green buoy 25 and flashing red buoy 26 clearly visible in the lower center portion of the image where two boaters are passing each other. In the mid-1600s Augustine Herman, a Dutch envoy and mapmaker, observed that two great bodies of water, the Delaware River and Chesapeake Bay, were separated only by a narrow strip of land. Herman proposed that a waterway be built to connect the two. The canal would reduce, by nearly 300 miles, the water routes between Philadelphia and Baltimore. The issue of constructing the waterway was raised again in 1788 by regional business leaders, including noted Philadelphians Benjamin Franklin and Benjamin Rush. In 1804 construction of the canal began including 14 locks to connect the Christina River in Delaware with the Elk River at Welch Point, Md. But the project was halted two years later for lack of funds. 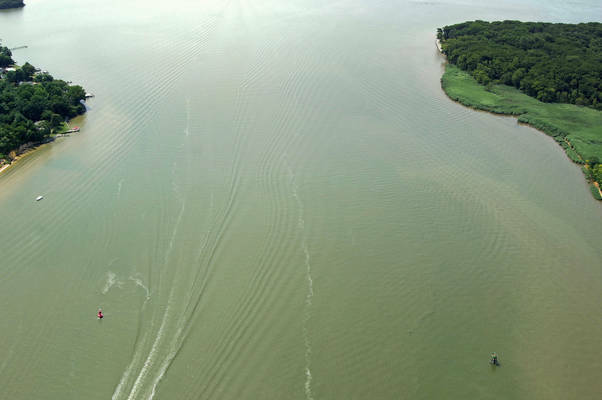 In 1954 Congress authorized further expansion of the channel to 450 feet wide and 35 feet deep. These improvements began in the 1960s and were completed in the mid-1970s. 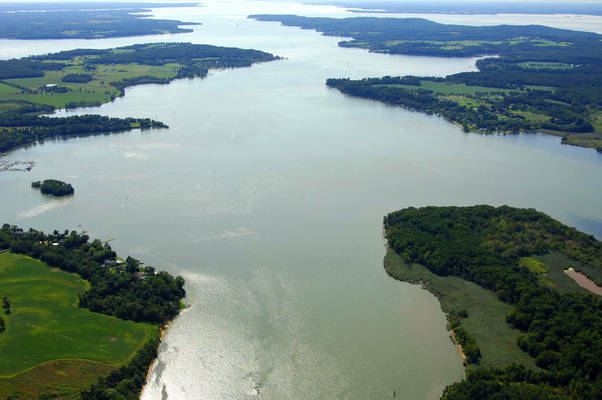 The western end of the C&D Canal meets the Elk River and Back Creek at Welch Point about four miles west of Chesapeake City. The C&D Canal is a major commercial thorofare. In fact, it is a rare occasion that a C&D transit is made without seeing a large commercial vessel plying the canal waters. For this reason, a vigilant watch is required, and safe distances must be kept from all large commercial ships, tugs and barges. The tide on the C&D Canal is of particular importance. There is a four-foot tidal difference at Reedy Point, and currents can run as high as two knots so we advise traveling on a favorable current. The flood tide runs easterly on the C&D and the ebb sets to the west. Consult a reliable tide chart before you plan your trip. Once inside, it is only a matter of staying mid-channel and clearing the bridges. The Conrail Lift Bridge across the canal is typically left open unless rail traffic is present, and even then it has a closed vertical clearance of 45 feet. All the other bridges on the canal are fixed high vertical clearance spans. 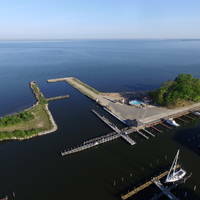 From the Chesapeake Bay west of Courthouse Point (about one mile away from the entrance), pick up flashing green buoy 23 and flashing red buoy 24. Once you have intercepted flashing green buoy 23 and flashing red buoy 24, continue off to the northeast to pick up flashing green buoy 25 and flashing red buoy 26 just off Welch Point. Inside the canal itself after flashing green 25 and flashing red buoy 26, follow in flashing red buoy 28, flashing green 29, flashing red 30,  green buoy 31, and then flashing red buoy 32, which rounds up the last channel marks in the canal until you reach Reedy point at the east and of the canal at Delaware Bay. Lights and other aids are available at bridge crossings. No reviews yet! 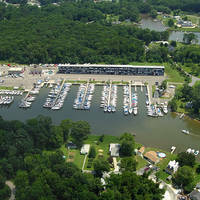 Be the first to write a review of C&D Canal West Inlet.